How? How is it that the entire day went by and I STILL don't know what to make for dinner? I find myself entering dangerously close to the "whine" line, where the kids pave the way for the dinner hour with complaints of hunger that grow increasingly more pathetic. Just as I enter that last half hour, the kids rolling on the floor dramatically holding their little tummies, I frantically grab at the first box of what-ever-that-was to "whip up" something. Forty minutes later I am sighing with relief, as the kids and hubby wolf down their admittedly mediocre food, and I am safe for yet another day...until breakfast when I will do this dance all over again! Nope, I don't want to do this forever...That's how I eventually came up with the perfect solution! I created an easily reusable Menu Planner, one that includes a much needed idea section. Yep, I can't decide if the worst part of cooking is the clean-up or the 2 hours before when you're racking your brain for ideas on what to cook. Well, no more sir! I'm not sure how to elude the monstrosity that is my kitchen after cooking (I'm a ridiculously messy cook), but I refuse to settle for menu mediocrity. So menu planning strategy it is! 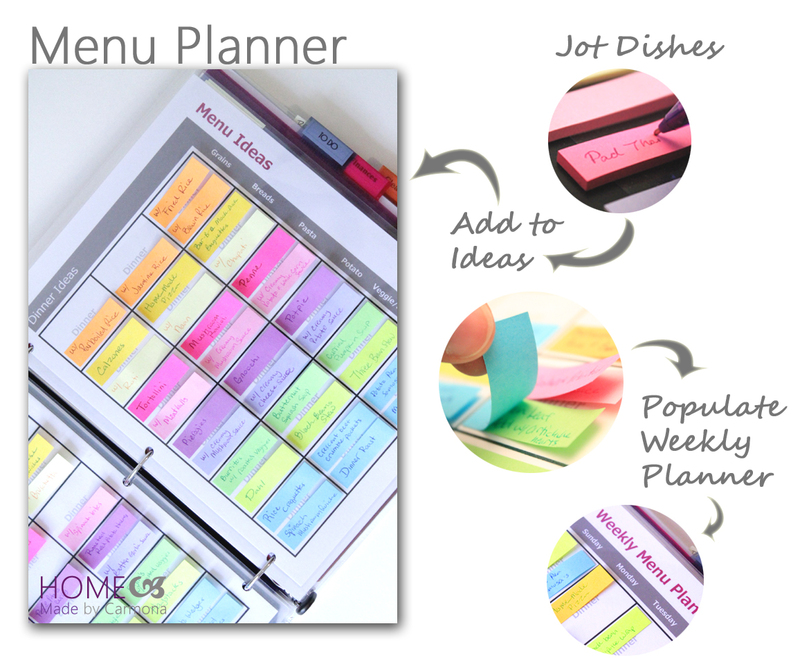 I have been employing this menu planner for a few months now and it has been my saving grace! We are eating healthier meals, it takes less time to prepare meals, I am saving gads of money, and we have culturally diversified our meals more than ever! It's a win-win-win-win! To save money: Pick one day to in advance to plan your meals. Create your menu and shopping list at the same time by browsing the sales ad's as well as your cupboard. To save your health: Try a new dish and a new seasoning every couple weeks. Keep the food pyramid in mind when menu planning, and include more fresh fruits and vegetables. If you need to, prepare your vegetables, and salads the week in advanced...you'll be more motivated to eat what has already been prepared. To diversify: Try a new dish and a new seasoning every couple weeks. Glean inspiration from Pinterest Pins, or go online to a recipe directory such as allrecipes.com . Why sticky tabs? 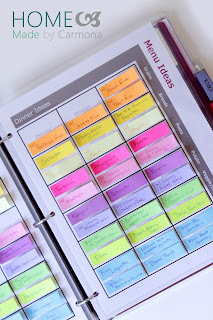 I like my menu planner to be tactile, and I am constantly changing my mind, or moving my meals around. This allows me to do so easily, without constant erasing or scratching out ideas. You would think these page marker sticky notes would lose their stickiness over time, as long as they are housed between two laminated sheets, they will not come off, or lose their stickiness. 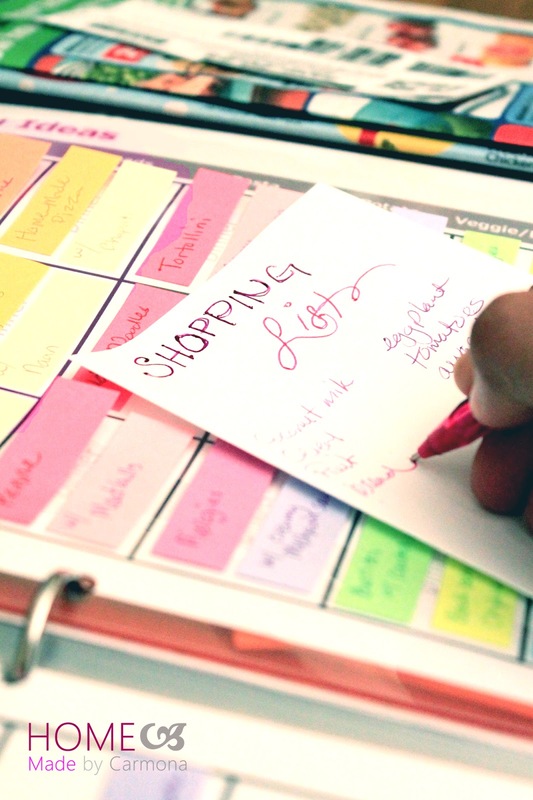 The how to use is easy...besides the obvious grid/post-it operation, there are a couple little tricks I use to keep my menu planner working for me. The menu planner is divided into two parts: The Weekly Planner, which I reference to see what is being made for each week of the month. The Menu Ideas section, which is where I take from to populate my weekly meal plan. First take the time to populate the Menu Ideas section. 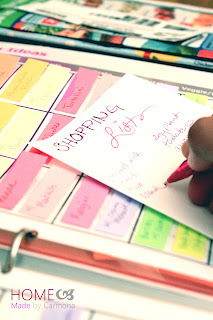 Go crazy, write on post-it page markers all the dishes you've ever wanted to make... the dishes that make you look like a superstar, the trusty dishes you cook weekly, etc. I went on Pinterest for inspiration and went wild! Next glean dishes from your Menu Idea section to populate your Weekly Menu. This is also the time to make your shopping list. You know , it is far easier to show than to tell: Watch my YoutubeMenu Planner webisode to see how, and gain a few important details. Simple. 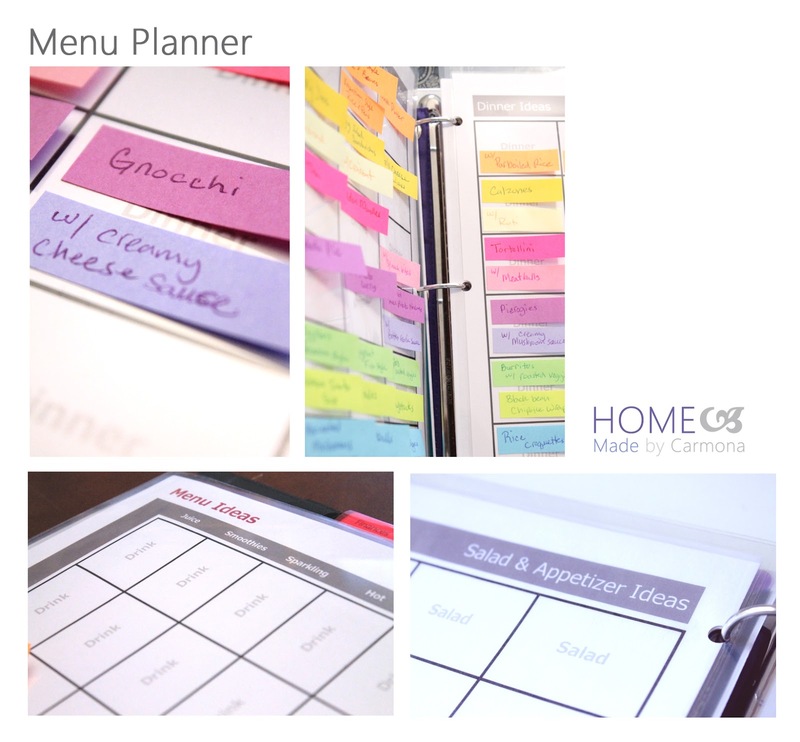 Customize, print, laminate, punch holes, and start populating your menu planner! I've done most of the work for you, but I won't take away the fun of personalization! 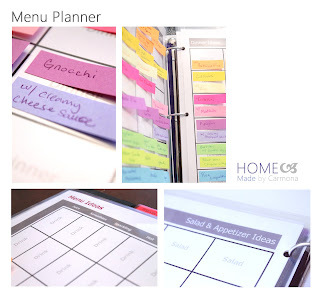 Below you will find the Menu Planner printable in word format that you can download and customize, or in pdf format for those who want to print and use as is. Just remember, the word format will be a little discombobulated and needs to be downloaded to view and alter. If you do not own a laminator, use Scotch brand full-sized self-laminating sheets, just follow the directions on the package. Type in Your Own Categories: My categories are: Drink Ideas, Salad & Appetizer Ideas, Breakfast Ideas, Lunch Ideas, Dinner Ideas, and Dessert Ideas. Use as many pages per category as you like. Decide your layout and page order, and place pages back to back so they will be double sided before laminating. Type in Your Own Subcategories: My planner contains subcategories according to the way I plan and search for meals. Personally I think of my meals by predominant ingredient or meal base: Grains, Bread, Pasta, Potato, Vegetables & Legumes, and Sides. A more "normal" labeling method would probably be: Appetizers, Bread, Pasta, Soup, Salad, Sides. Or perhaps label according to cultural food type: Asian, American, African, Indian, Italian, etc. The ideas are endless, the point is to divide up your sections according to the way you think. Color-code Subcategories with Post-its: Keeping your subcategories further defined by using one or two colors in each section will make it quick and easy to put the stickies back in their place when not in use. Don't forget to customize your stickies too! I chose to use Post-it page marker signets, but I loved the adorable Martha Stewart brand 1 1/2" x 2" size as well! Change the Font & Colors: While you're already customizing, why not make it suit your personal style? Whether you change the font, or the colors, or drastically change it, you'll be more motivated to use something you put a little work into.